Like thousands and thousands of other Whovians, I never dared imagine or dream that this day would come. When the Tenth Doctor uttered those soul crushing words, “I don’t want to go”, at the beginning of his regeneration into his Eleventh incarnation , it seemed inevitable that his days of wandering the cosmos were well and truly over. Okay, yes, he returned, all too briefly, during the fiftieth anniversary story The Day of the Doctor, but it was as part of another Doctor’s story. It wasn’t his time, it wasn’t his place and, as wonderful as it to see him wielding the sonic and helping to save Gallifrey and in doing so, his soul, it wasn’t a Tenth Doctor story. His time, or so it appeared, was over. Or at least that’s what we, and by we I of course mean me, assumed until Big Finish announced that the Tenth Doctor and Donna would be returning to the Tardis. That he and his erstwhile companion would, once again, be hurtling through all of time and space, bouncing from planet to planet and from one point in time to every other in order to save everyone from everything. In the wake of that news, my countdown began. The minutes, hours and days dragged by until after what seemed an eternity but in reality was more like months, which I hasten to add were filled with all of the other life stuff that happens, The Tenth Doctor Adventures finally arrived. Was it worth the wait? Oh yes, it was worth every second and far more. Because it is, as one of the Doctor’s former selves was so fond of saying, fantastic. 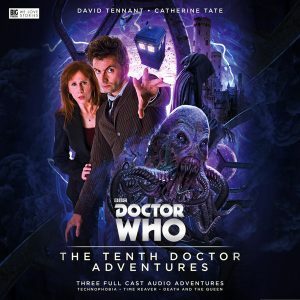 The Tenth Doctor Adventures Volume One is comprised of a trio of classic Tennant / Tate style stories (all of which I hasten to add, are available to buy separately so you don’t need to purchase the boxset if you just want the adventures) that throw the time rotor into overdrive and don’t pause for breath or let up for a single second. As they’re unconnected and don’t depend on a series MacGuffin, the order in which the tales are listened to is irrelevant, but for the sake of expediency (and to make it easier for yours truly) and in chronological running order in the set, the Doctor and Donna’s “return” to the Tardis begins with Technophobia. Taking place in slightly-in-the-future London, it’s a tale of stealth invasion via devolution that finds the Doctor and Donna struggling to discover why the population of the capital has suddenly developed a deathly aversion to all forms of technology. 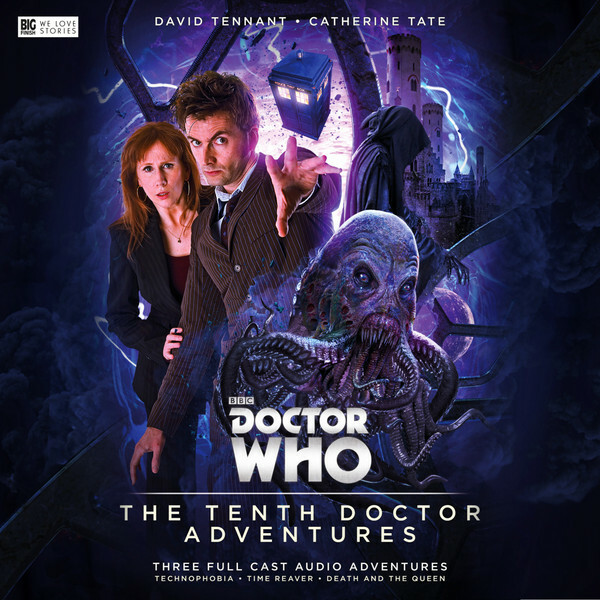 Filled with snappy, punchy dialogue and a central idea that most Sci-Fi writers would kill to have thought of, it’s a sharp and astute critique of modern society’s over-reliance on gadgetry and machinery that also happens to an outstanding Doctor Who offering. It’s swiftly pursued by Time Reaver, in which the Doctor and Donna are forced, in an attempt to find spares for the Tardis, to visit Calibris, the galactic equivalent of eighteenth century Port Royale. Home to freebooters, pirates and all types of nefarious ne’er do wells, it’s the sort of place that the Doctor loves, and when he and Donna discover that an ancient and forbidden munitions are being traded there, they become unofficial customs agents in order to close the supply down for good. But they’re not the only ones hot on the trail of the armaments, and in an emotive, action filled and very human drama that explores the well-trodden road that’s littered with the remains of good intentions, they come to understand that even bureaucracy craves nothing more than a perfect, final moment and that in the wrong hands, time is the deadliest of weapons. Then last, but certainly not least, in Death and the Queen, Donna is given her hearts-desire when she’s granted the kind of fairy-tale ending that most little girls fantasise about their entire lives. The Doctor, having been around a little longer than his friend, knowing that there’s no gold at the rainbow and that true happiness is at best fleeting, smells a rat and finds himself battling Death and his armies to save his companion and a Kingdom that he’s never heard of. It’s the kind of bedtime story that’ll make you hide under the sheets, always remember to read the small print and question the all-too often blurred line between good and evil.